Last week I wrote up my fair isle inspiration post, and I at last chose and completed a pattern! Can you see my mistake? I probably just obsess over tiny details but I messed up one row of the pattern by either skipping a row or doing a different row in its place. But for my first fair isle/stranded knitting I think I did a pretty good job! 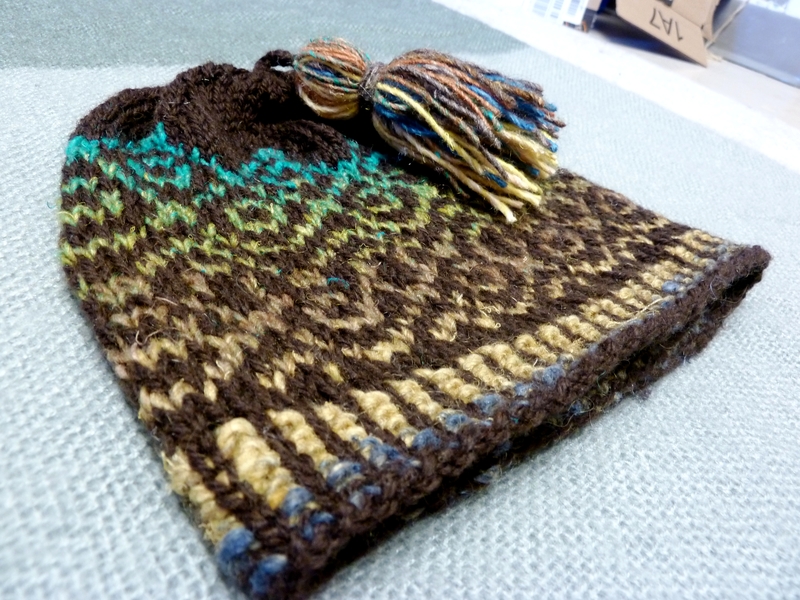 What I love about the Blumme Beanie is that the color work is pretty simple which really brought out the beautiful colors of the Noro Silk Garden I was using. However, it ended up using so much less than I expected so now I have a lot more Silk Garden left over! Maybe I’ll make myself some matching mittens next. 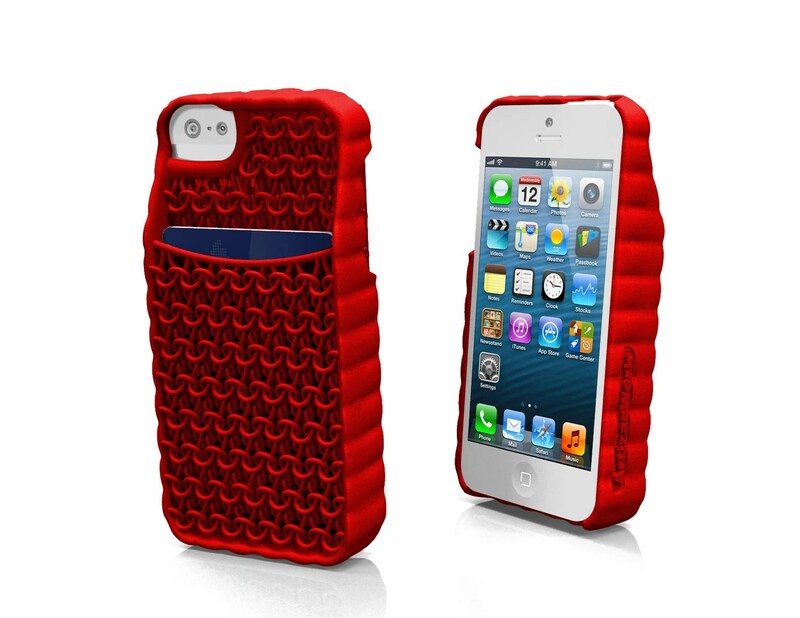 I was looking around Etsy for a new iPhone case and I came across very cool and innovative designs. 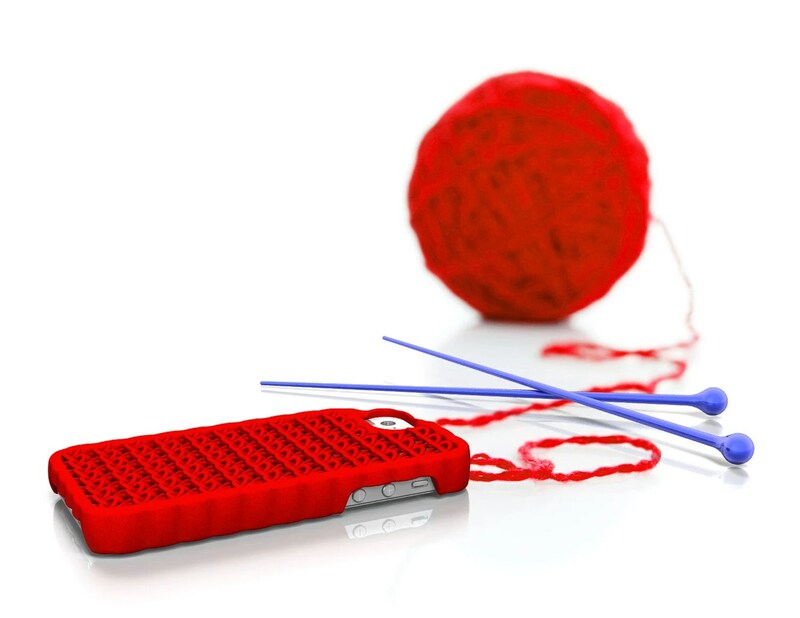 This case is hard and durable and it’s knitted by a robot using 3D printing to make it look like actual knitting. The funny thing is, for a while I’ve had the idea to knit a similar kind of case (not a cozy/sock like most other knit cases) with a pocket for my student ID for when I didn’t want to lug around my clutch or a purse. The only problem I could not get around was finding a way for the case to stay on the iPhone without obstructing the screen, side buttons, or camera (much like the cases above do). The closest I came to was coming up with a design that would have a hole for the camera and light that would have to be sewed or glued onto another plastic case. Basically it would look exactly like the second design pictured above but it would actually knit from a fiber! And here I thought I was being clever, but someone already beat me to it! Maybe if I actually find a way to attach it to my phone I could make the next big thing. The day The Click Five announced that they were parting ways. I can’t even explain in words how much this band means to me. When I first heard Just The Girl back in 2005, when I was just 12 years old, I had no idea how much I would love The Click Five and dedicate my time and ear to them. 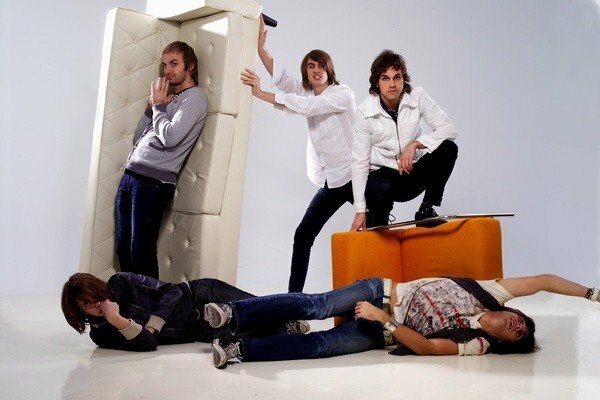 For almost 8 years, The Click Five has been my favorite band. These 8 years weren’t always an easy journey, for me and the The Click Five, and in a way I feel like I’ve grown up and out with them. The quintet, originally composed of Eric Dill, Ben Romans, Ethan Mentzer, Joe Guese, and Joey Zehr released their first album Greetings From Imrie House August 16th, 2005. The date is important because it is also my sister’s birthday. I remember buying myself their CD as a birthday gift for myself when my birthday came around in September. I had just started middle school. I was addicted to listening to the CD. I listened to it everyday after school while I did my homework. Needless to say, I quickly memorized every lyric and even the tracklist so I automatically knew what songs came after which. I somehow found my way onto the Click Five message boards, affectionately called “The Boards.” I think this is when I was really converted into a fan. As people in fandoms generally are, I thirsted to learn every little bit of every member as I could. Their birthdays, favorite colors, nick names, hometowns. I religiously watched their tour diary videos over and over again. I desperately wanted to be able to witness one of their concerts in person but for the time being, I bonded with other Click Five fans from around the US and only managed to see The Click Five live through low quality phone video recordings. They blew up. Just The Girl was a hit. Everyone knew the song. I was proud enough to state that they were my favorite band at the very mention of their name. They held a world tour. They traveled to Europe. They filmed a movie, Taking 5. They now had fans from around the world. Back at home, I was proud of their success and recognition. I had never met any of them and I couldn’t even say that I truly knew what their personalities were like. All I knew was that these guys had a talent for making music, and I connected with it and was invested. Fans were eagerly anticipating a second record, hearing bits and pieces of new tracks at shows and through Youtube clips, but somewhere between 2006 and 2007 something un-Clicked. Eric was leaving the band. This came as a shock to many, and with Eric’s departure was also the departure of a good portion of the fanbase. He was the lead singer, after all. Most people recognize a band mainly by their lead. He wanted to pursue a solo career and I wished him luck, understanding that Eric and the rest of The Click Five had musical and career differences. What I realized then was that although I loved Eric’s voice, it was the intangible and indescribably distinct Click Five sound and songwriting that kept me coming. As long as Ben Romans and Ethan Mentzer kept writing the Click Five songs, I would keep loving them. Along comes Kyle Patrick. Some fans resisted him, by I kept an open heart and open ears. Little did I know that this man would change my life. Four words: Band Behind The Band. A new marketing strategy to reignite the hype that had disappeared since their very successful first year and just videos full of hilarity and near insanity. Sometimes I think that they blew up too fast because by 2007, The Click Five was virtually unknown and it was a shame because that year an amazing record came out. This was my chance at last! I remember absolutely freaking out in my cousin’s basement when I found out that The Click Five was giving a free concert right in my hometown of Wilmington, Delaware. I had to go. Otherwise I would probably die. The Wilmington Flower Market show was my first concert ever. I was 14, about to finish up middle school and start a new chapter in my life as a high school student. It’s funny how so many events relating to The Click Five coincidentally related to important moments in my real life. This was Kyle’s first show as an official member of The Click Five and the first on their tour to promote their new album Modern Minds and Pastimes. 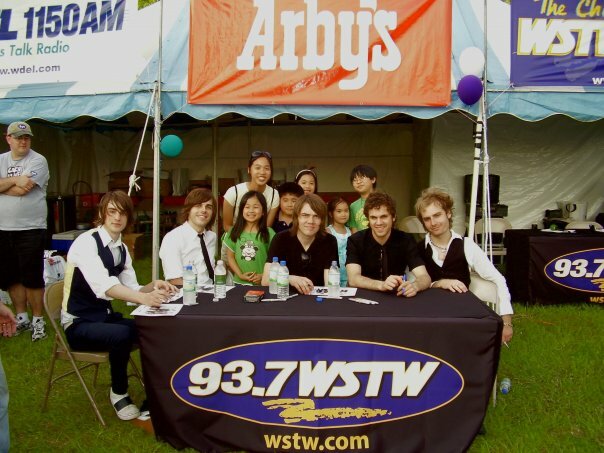 I recall standing in line at the end of the show to get autographs and a picture when the girl infront of me asked her friend who the lead singer was. I promptly responded, “His name is Kyle.” I had been following the band’s journey with Kyle since the beginning and I was proud of it. Admittedly, I didn’t remember Kyle’s last name at the time. (P.S. Patrick is his stagename, understandably since his real last name is Dickherber.) I got a picture and autographs. I witnessed them performing live. I told Joey happy birthday (which was the day before), slightly disappointed in myself that I didn’t think to make him a birthday gift so I could be one of those fans that they’d remember. But my life was complete at the moment. This was a phrase I often caught myself saying after anything Click Five related. When their sophomore record came out I listened to it just as much as their first one. My cousins and I filmed a music video for Headlight Disco which, according to my brother got 17,000-something views on Youtube. When I think back to it, it’s kind of embarrassing, but at least I played director and editor so my actual person wasn’t in it haha! Somehow during the 2007-2008 period, the band garnered a massive fanbase in Asia, which is/was their biggest market to today. It still confuses me to this day how it happened, but I commend them for it and I commend Asia for recognizing the raw talent that was resident in the band. Asia knows what’s up. The Click Five partnered with MTV Exit, a non-profit organization dedicated to bringing awareness to and stopping human trafficking, a problem that is prevalent all over the world, but especially big in Southeast Asia. The members put in a lot of commitment to the cause, giving benefit and awareness shows and personally visiting victim shelters in countries like Cambodia. This only gave me another reason to dedicate every fiber of my being into loving them as musicians and just beautiful people in general. Throughout 2008 and 2009, The Click Five played smaller venues up and down the East Coast. After my first Click Five concert experience, I was desperate for another and I actually had many chances to see them as they played shows in Philadelphia pretty often, but they always happened on a weekday when I had school so I never had the chance. They were working on a new record. Again, fans were waiting for it and kept being teased by tour diaries and video snippets. But of course, there was another bump in the road. They split ways with their label, which prevented them from creating the music they wanted to. That’s the thing I don’t like about mainstream music and record labels. They don’t let their artists do what they love. Although The Click Five was much more handicap financially without a label backing them, the music they wrote during that time was the best yet. I still think it’s funny how The Click Five’s journey as a band is opposite of how many bands reach fame. Instead of being discovered as an indie act that reaches mainstream popularity like, for example, Imagine Dragons or Fun, The Click Five went from a heavily manufactured experience to a band that had to self-finance their album and reinvented their sound to fit a much more mature audience. Over the past 3 years, I think most fans were in the dark with what was happening. People were unsure of whether the band was still together and making music. Kyle was working on solo music and doing tiny solo shows. Singles were released but did not reach popularity outside of the current fanbase. There would be moments when you’d think that the band was about to make an epic comeback into the music scene and then your hopes would be let down. During that time I bought a vinyl with two of their new tracks I Quit! I Quit! I Quit! and Be In Love. Yeah, I don’t own a record player. At last released their third and now final album TCV in 2010, first to Asia, then worldwide later in 2011. It was by far their best work. Philly, World Cafe Live, Downstairs. I was a Senior in high school and I was done with my finals. All I had to do was graduate. This was not a show I could miss. It had been 5 years since I had seen The Click Five live and with the especially bumpy musical journey these guys had, there was no way of knowing when I’d get the chance to see them again. I’m actually pretty fortunate in comparison to a lot of Click Five fans who don’t live so close to the Mid-Atlantic Region. It was one of the best nights of my life. Words cannot explain it. It’s just a feeling. Here’s a video. And time goes on. These guys have had an influence on my life in more ways than one. Kyle started his solo PledgeMusic project which I’ve posted about before. He’s getting so much positivity in Asia right now. I wish him the best and I hope he gets some more recognition here in the states. Oh and Kyle, if you read this, will you ever go back to your singer-songwriter style? I miss it. Kyle’s really good friends with Jesse Ruben and that’s how I was introduced to his music, and is now one of my favorite songwriters. Both Kyle and Jesse have both inspired me to be the best that I can be and chase my dreams. They are proof that hard work and dedication to a goal or cause will make a difference. One day, I hope to run the NY Marathon beside you guys. Almost as religiously as I used to listen to GFIH I read the Mr. Kate blog. Kate Albrecht, entrepreneur, lifestyle blogger, and DIY-er extraordinaire is also Joey’s girlfriend and my ultimate role model. I don’t quite remember how exactly I found her blog or her connection to The Click Five, but she was also in Taking 5. She has also inspired me that success as a woman and crafter is possible and I hope to follow her footsteps one day. Joey, you’re an awesome person for supporting your leading lady in her dreams. I have to mention that the reason why I read one of my now favorite books, 1984, was because it was the book that was chosen for the Click Five Board book club, run by Ben Romans himself. Ben Romans, thank you for introducing me to my now favorite genre of book. And Ben, you are an inspiration to a classically-trained musician and piano player that the music doesn’t stop there. I hope to develop my skills one day and be able to play pop music without it sounding awkward and maybe even write my own songs. Ethan, you were my favorite member back in my teeny-bopper fangirl days. Thank you, for writing Don’t Let Me Go. The song has touched countless people without even you intending it to do so. I entered the video contest for MTV Exit and did a lot better than I expected. That song and The Click Five’s involvement with MTV Exit made me more aware of the issue of human trafficking and has got me thinking into working in the non-profit industry after I graduate college. I want to be able to make a difference, no matter how small. I feel like I have to write about everyone now. Joe, I never really knew much about you but your role in The Click Five was definitely important. You’ve always kept to yourself and never said much… anywhere but that’s just you, I guess. Oh, and it was your birthday recently, so happy birthday! And finally, Eric. To be honest, I haven’t really followed your solo career but I’ll occasionally find myself listening to a few of your songs when I stumble upon them. Although you are not a part of The Click Five I love today, you were a part of The Click Five I loved in the past and it was the original five members that initially drew me into the band. I’m sad that I never saw a Click Five show with you as lead vocal but thanks for being a part of the journey and experience. This is proving to be more difficult than the first week. I found myself running out of time and frantically searching for an interesting shot in the late hours of the night (which sometimes technically counted for the next day.) And I’ll admit that I cheated. I used two photos from Saturday because I took a few good ones and didn’t get a chance to take any today. I got to show off the socks that I knot for myself. “Be Strong” was a cool tag I found attached to a bush near campus. Whenever I have to walk somewhere I’m now observant for any potential photos and it really helps me focus on my surroundings and admire the beauty of life. I have 2 exams this week, eek! Wish me luck! I hope they aren’t too hard, but for now I’ll get back to watching Once Upon a Time.